A new state law requiring children be vaccinated is adding an extra layer of stress for many on the first day of school. 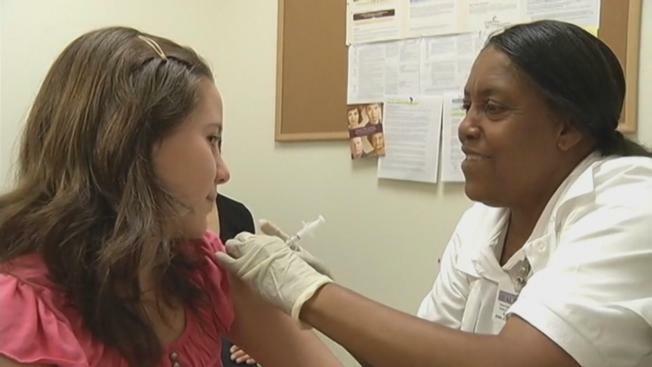 Senate Bill 277 took effect in July, and there are reports of students being turned away in areas including Sacramento and San Diego for not having proof of immunization. Many South Bay schools start classes this week. San Jose Unified, the South Bay's largest school district, is preparing for Wednesday's first day while some vaccine opponents are preparing to stay home. "I've done my research into it for the past eight years, into the chemical ingredients and side effects," said Tina, a mother of five who has decided to home school her kids. "It used to be measles and chicken pox were rites of passage for kids. Knowing how healthy my children are, I'm not going to subject them to something I don't believe in. It's a basic human right to decide what you put in your body." The district's head nurse, Melinda Landau, is dealing with many families turning in immunization forms, even though notifications began during the summer. Of the district's 32,000 students, only 30 families have sought medical waivers or turned in so-called "personal belief" waivers before the start of the school year. Landau said students who can't prove immunization or provide medical reason not to will be turned away. "We're bound by California law," Landau said. "We have to follow the law. We need parents to understand that they need to immunize or have a medical waiver, or their children can't attend school. It's not a matter of us deciding what side of the issue we're on. It's the law." Santa Clara County's Public Health Department agrees. "If there's just one of us that isn't immunized, then that person is susceptible to disease and can spread it to others," Dr. George Han, Public Health officer, said. San Jose Unified said only two families have officially left school. But, as other areas have already found out, the first day will tell.